Enjoy having all of our fabrics in the palm of your hand, with our handy selection of 110 fabric swatches. Select from four packs of fabric swatches; Classic, Natural, Leather, and Paper. Each pocket-size pack features a selection of fabrics from our extensive personalized fabric collection. The samples come ready printed, which will not only give you the opportunity to feel before you buy, but you will also be able to see the incredible print quality and compare each fabric. We print the fabric name and ID number onto each and every fabric sample. Get your money back. If you buy a swatch pack, we issue you a coupon code to get a great discount on your fabric or leather order*. Make a fully informed decision on what fabric is right for you, with our collection of 4 fabric swatch packs. 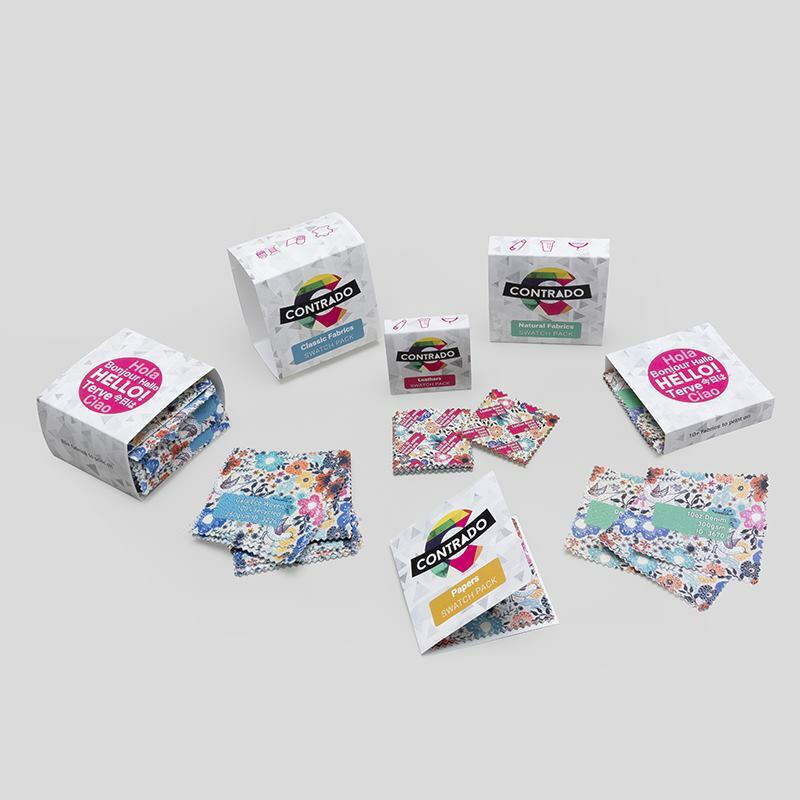 Each swatch pack features a range of textiles from our custom printed fabric range. The detailed and colorful print on the samples will help you compare the differences in surface texture and print quality. Whether you are looking for a velvet, a matt paper, or something completely unique like neoprene, you will find them in these useful packs. I’m very pleased with the variety of fabric options and shipping was SUPER FAST! Can’t wait to order again! Fabric swatches arrived so quickly and the fabric options were great. So thankful to have found your company. As well as being a great size to keep at hand for reference, we have also tried to make your fabric selection choice even easier by printing the names of each fabric type onto the sample. This way, it will be even easier to place your custom printed fabric order at Bags of Love. To help visualize how any of our 110 fabrics will work in your home or for your individual project, use our Fabric Swatch Books. 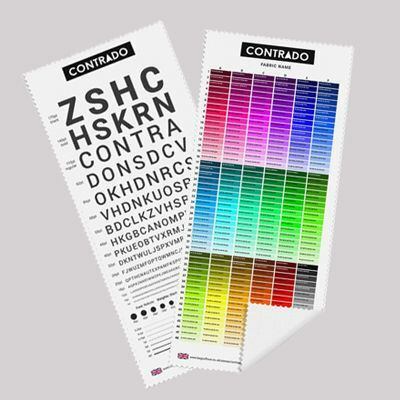 We also offer samples of our fabric labels which may be useful to you. This extensive selection features our wide range of beautiful man-made fabrics. From weaves to knits and velvet to lace, you will love sifting through these beautiful textiles. Made from 100% real leather, see the thickness and texture and feel the handle of these beautiful leathers for yourself. The leather swatch pack is a smaller 2" x 2" size. We source the best leathers from our tanneries for printing on. Includes goats leather as well as cows leather and use the most up to date printing technique, specifically for leather printing, to ensure great color reproduction and fine detailing. As well as customized fabric, we also offer a wide range of fully customized papers; textured wallpaper, glossy satin finishes and lots more. 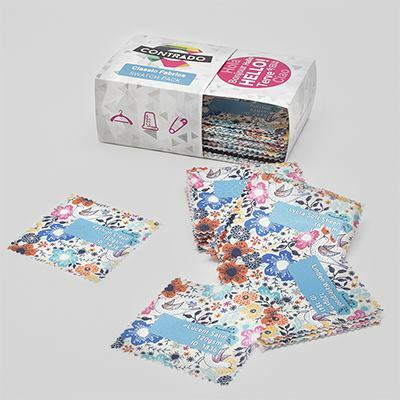 *Voucher cannot be used for test prints or samples. Minimum spend: $25. Offer exclusive to new customers only and can only be used once. Voucher expires after 30 days. We print a standard design, onto the range of fabrics that we offer. We use the same digital printing method we use for the fabrics that you order, and we use the same design on each fabric so that you can see the difference between the print detailing as color reproduction as well as experience the handle of each fabric for yourself. We also print the ID number and the name of the fabric onto each piece, which you can use when you are trying to locate that fabric once you have decided which one you would like to use.